20 Years Magnificent! "Blues for an Alabama Sky"
Have you ever over-romanticized a memory only to relive the experience and it not be quite as fabulous as you remembered? That's not one of those stories. I've regaled for 20 years what a magnificent experience Blues for an Alabama Sky was in 1995. Seeing it again, having not reviewed much about the 20th anniversary production, I sat on the front row in awe, enveloped in the wonderment of magnificent performances, with decades-old memories of that beloved play flooding over me all the whilst enjoying it as if I were seeing it the first time. As a long-time Atlanta theatre-goer, I was thrilled to learn that Alliance Theatre was bringing Blues for an Alabama Sky back to Woodruff Arts Center. The crescendo of my anticipation—having waited through summer, fall, winter and the beginning of spring—met with pure delight...it was worth the wait! Blues for an Alabama Sky is a story of hope and hopelessness, dreams, progress, conflict, and the dark side of narrow-mindedness. It's a story of how some things never seem to change, as well as tenacity leading to dreams-come-true. 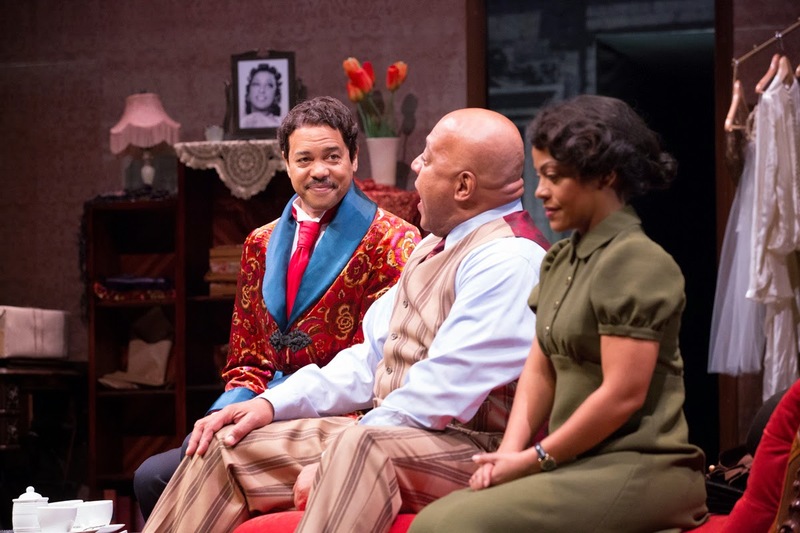 Tony Award-winning Broadway and film director, and Artistic Director of Alliance Theatre when Blues for an Alabama Sky premiered 20 years ago—Kenny Leon is a super-force in the Atlanta theatre scene. He directed Blues when Phylicia Rashad was in the lead role, and what a magnificent actress she is! I'd only known her from television and Blues was the first time I saw her perform live. You never once saw any character on stage except Angel Allen. I am and shall ever be a fan of Phylicia Rasha. Harlem, New York, 1930. The harsh realities of the Great Depression have devastated the bright decade of the Harlem Renaissance. Disease and poverty have overshadowed the creative euphoria that fueled a surge of African-American artists, writers, and luminaries. A story with a rich cast of characters, scrambling to survive and make sense of their overlapping personalities, politics, and love. A classic by Atlanta’s own Pearl Cleage, as timely today as when it received its world premiere at the Alliance Theatre 20 years ago. 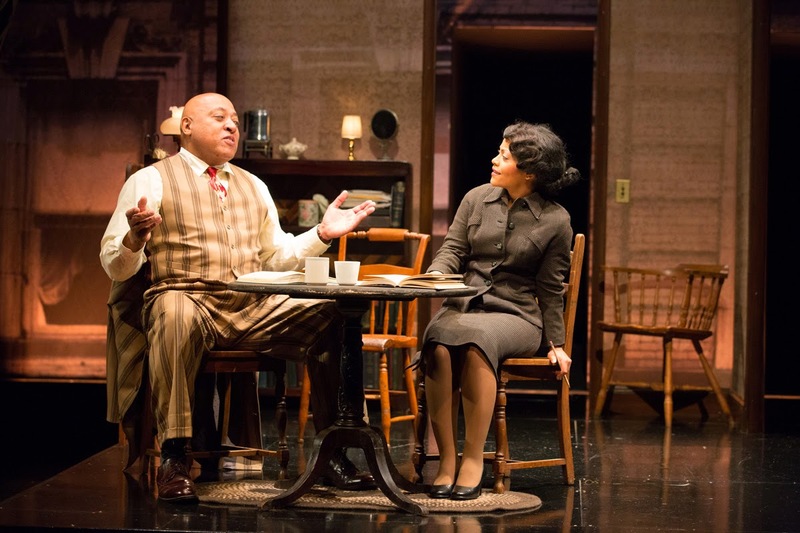 Having fallen in love with Phylicia Rashad as an actress when she portrayed Angel Allen 20 years ago made it challenging to go into the anniversary performance not thinking heavily about the original show. But possibility of comparison was quickly dispelled when it became obvious that Crystal Fox owns the role...she becomes Angel. Crystal Fox (pictured above) delivers a sublime performance. And she is true to character Angel Allen—a nightclub singer dumped by her Italian gangster lover and fired from his club, the same night. Angel is hopeful for a future she ran to years before, frightened of the unraveling economics of 1930, and trying desperately to fashion a life beyond mere survival...and struggling with hopelessness. 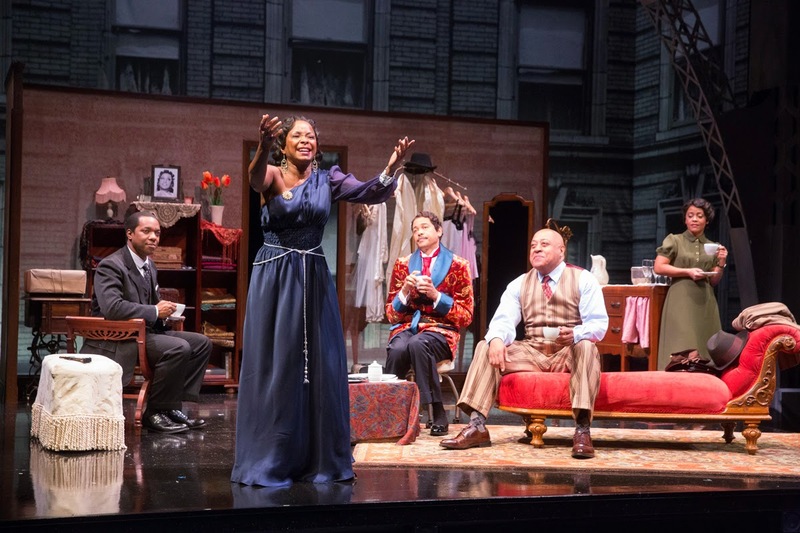 This I learned after seeing the 20th anniversary production: Phylicia Rashad hand-picked Crystal Fox to be her understudy. "Phylicia knew [Fox] was too young for Angel," said playwright Pearl Cleage, so I found it wonderful and so befitting that Fox would play Angel...it's like it was meant to be! Many will recognize Crystal Fox from Tyler Perry's soapy television drama The Haves and the Have Nots. May I offer my gratitude to Tyler Perry Studios and the Alliance Theatre for making it possible for Fox to "be in two places at once", for making it possible for her to grace the stage for this 20th anniversary performance. Guy, brilliantly performed by Tyrone Mitchell Henderson (left in the above photo), garnered more laughs from the audience than any other single performer. And consumed more "French Champagne" than any other character...even more than the worldly Angel! Tyrone revived his role as Guy, having performed the the character opposite of Rashad in a 1996 production, also at the Alliance, that was part of Atlanta's Cultural Olympiad during the Summer Olympic Games. The flamboyant fashion designer Guy, who moved to Harlem from Savannah with friend Angel, has a dream of joining Josephine Baker in Paris, toasting what he devoutly believes to be an eventual dream-come-true with glass after glass of "French Champagne", all the while providing for Angel's well-being. He's a true friend and does everything in his power to care for Angel and celebrate his other friends. Guy is an inspiration for perseverance of dreams, for commitment to friends and for bravery in being true to one's self...all the while being entertainingly hilarious! Tyrone is an Alliance Theatre veteran and one I hope we see more of! 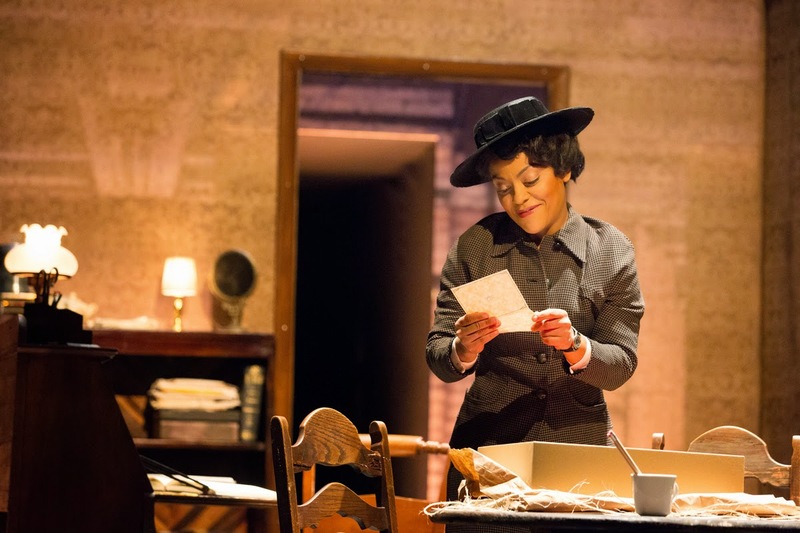 Tinashe Kajese-Bolden (pictured above), who portrayed Delia, is a new discovery for me and she's absolutely magnificent. Delia is steadfast in her determination to bring about progress in Harlem, even in the face of resistance and life-threatening danger. Her character is as innocent as she is strong, and Tinashe's performance of Delia is outstanding. Originally from Zimbabwe and a new resident of Atlanta, Tinashe is one that I hope we see a lot from. She certainly has an impressive resume and she's already making a remarkable impression on the Atlanta theatre scene. Keep your eye on her...she's a gem for our city! I want to call Sam a jovial personality, but that's too light a descriptive to impart on a performance as deep as what Keith Randolph Smith (left in the above photo) delivered in Blues. 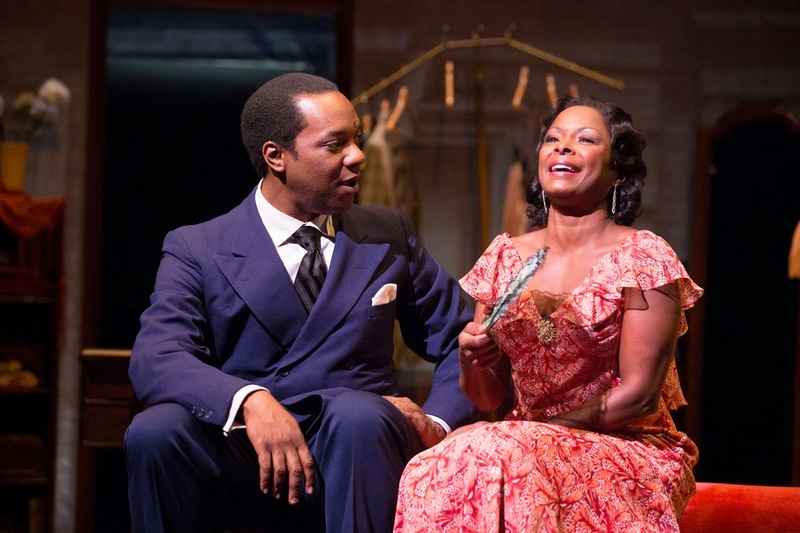 The character Sam struggles with the conflict he lives with as a physician who has the talent and knowledge to make a difference in his community, but is faced with the heartbreaking limits of Depression-era challenges and the decline of Harlem that had held such bright promise. Keith, who also has an incredibly impressive resume—of stage, television and film—gives perhaps the greatest range of performance...from a carefree party boy to sobering care for his friends, from vulnerable to conditions out-of-his-control to devoted and protective friend and love for one in particular, Keith's performance is a major contributor to my refueled love for Blues for an Alabama Sky. While the other characters in Blues I'm certain I would enjoy knowing and spending time with, Leland is probably not someone I'd get to know too well. Not as innocent as we're led to believe, Leland is too straight-laced, narrow-minded and overly conservative for my taste. BUT, a great performance was given, in this case by Neal A. Ghant (left in the above photo). That an actor can elicit such an emotional response to the degree of what Neal did says a lot...it says he's a world-class actor. Also a veteran of the Alliance Theatre stage, I hope we'll see much more from him...hopefully as a more lovable character. Congratulations, Neal, on a wonderful performance in Blues. "When the play premiered in 1995, my wish was simply for a successful first production. 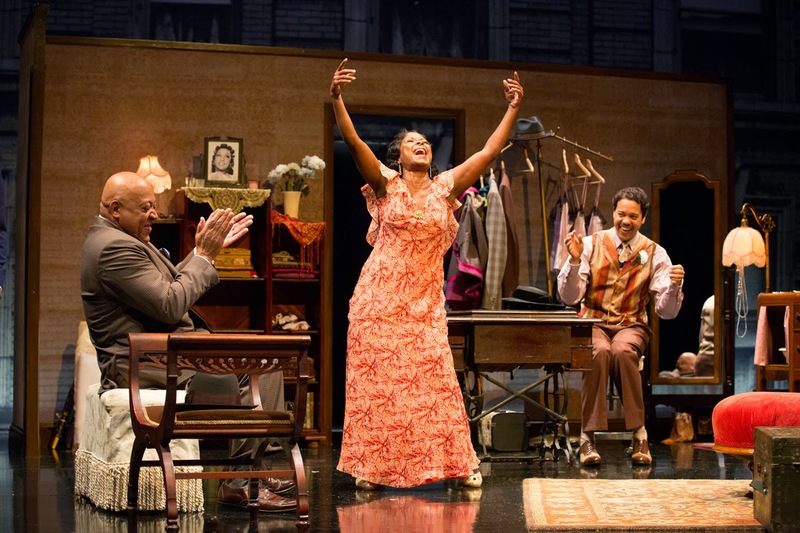 I'm happy to say that in the 20 years since Blues was commissioned not a single year has passed when the play was not produced on multiple stages across the country," said Blues playwright Pearl Cleage. My only personal regret is that it took me 20 years to see Blues again, yet seeing it again is a personal lifelong theatre-going highlight. I was concerned that the anniversary performance wouldn't live up to what I'd romanticized as one of the best-ever Atlanta plays. 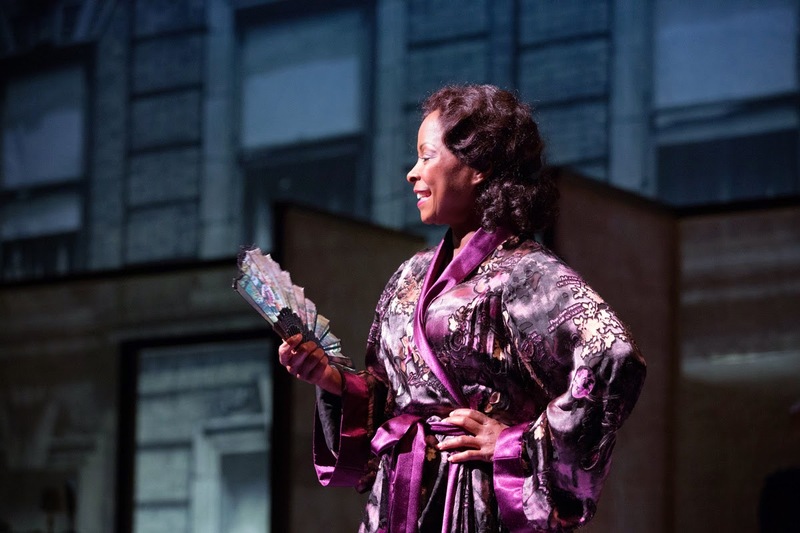 To the contrary, Artistic Director Susan V. Booth and playwright Pearl Cleage, together with a stellar cast, have sustained the magnificence of Blues for an Alabama Sky and ensured its place as an Atlanta theatrical icon for generations to come. Blues for an Alabama Sky is on stage at the Alliance Theatre now through Sunday, May 10, 2015. I hope to see it again, so maybe I'll see you there! Nick Cave's "Up Right Atlanta"
Friday night involved a lot of spectacular firsts for me. 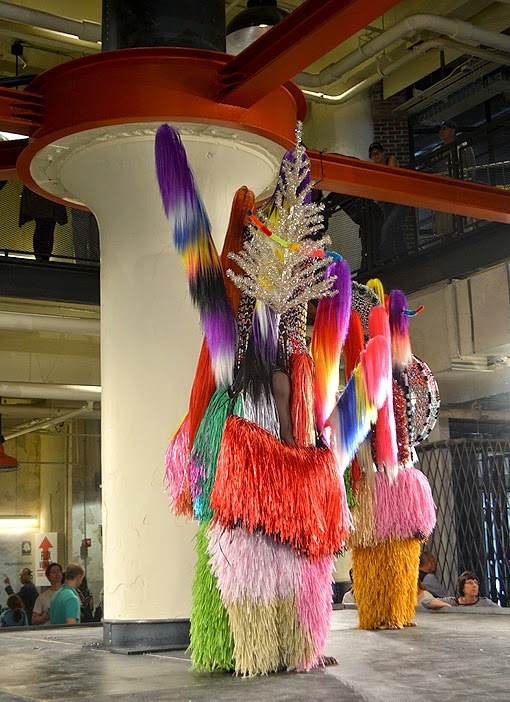 It was the first time I've seen Nick Cave's artistry, the first time I've attended a Flux Project event, and it was the first time I've visited Ponce City Market. It was a fantastic evening! 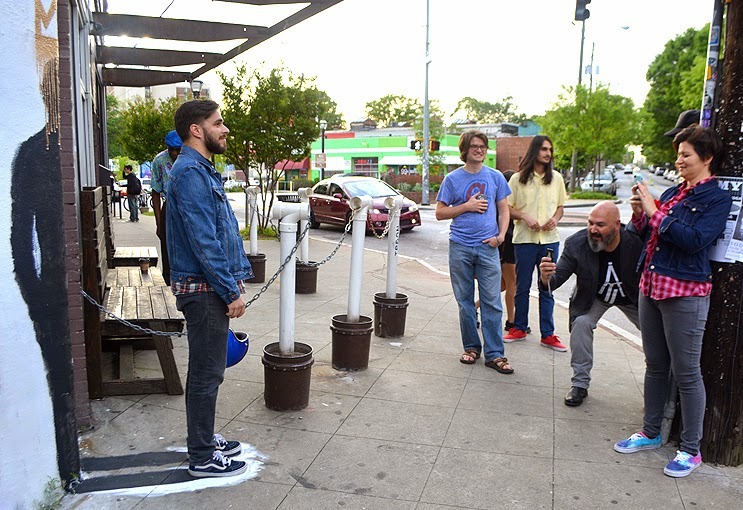 There are two shows per day throughout the weekend, of Cave's piece Up Right: Atlanta, each show being comprised of two distinct performances. I had no idea what to expect going in, but let me tell you...you are in for a real treat! Nick Cave is working with Tracy Lang, assistant professor of dance at Spelman College and artistic director of T. Lang Dance. 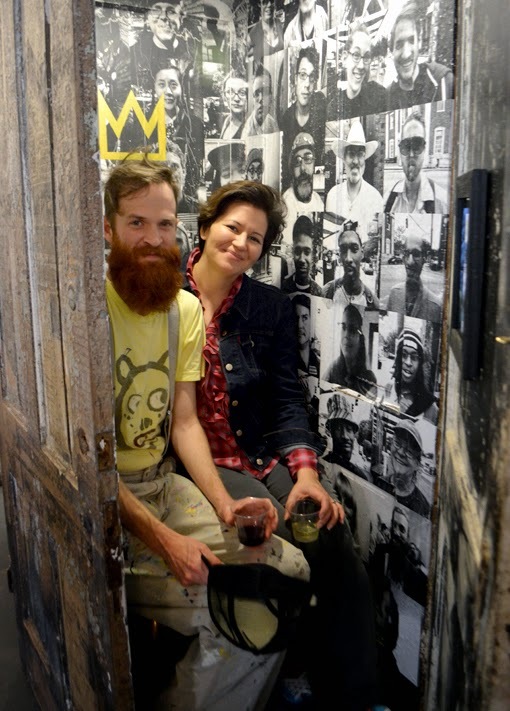 Thirty-one local artists—dancers, performers, and musicians—are performing the work. And it was obvious to me that each is committed to their art and to providing a remarkable experience. I'd like to share a little about the second performance first. It was the longer of the two, less energetic than the first, but just as—if not more—potent, and ascendant. 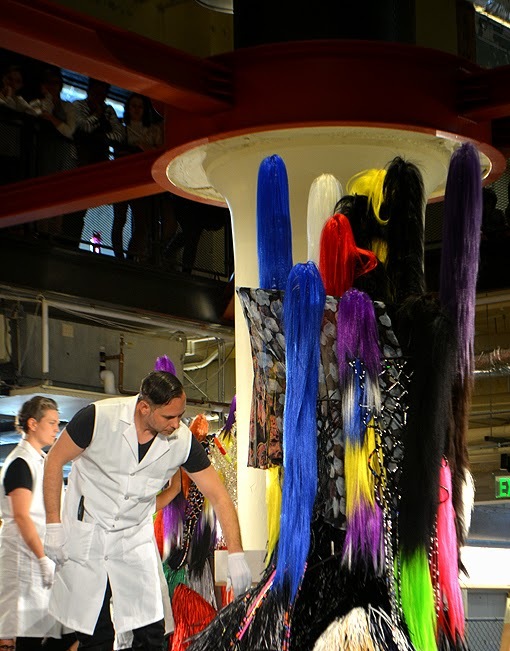 The adornment of the dancers began with encasing them in a prop-cradle infrastructure. I had surmised that at least some of the massive amount of props on the stage would become costumes, but I was blown away that ALL of it became costumes for the half dozen or so dancers. Believe me...there were enough costume elements to dress six times the number of dancers than were in the show. Cave initiates—the lead characters of this work. Through the performance, they are prepared mind, body and spirit to face the forces that stand in the way of self-hood, to enter a world over which they have complete control. Initiates become warriors of their own destiny. I was impressed that even the final checks and balances, after fully costuming the dancers, was given as part of the performance. 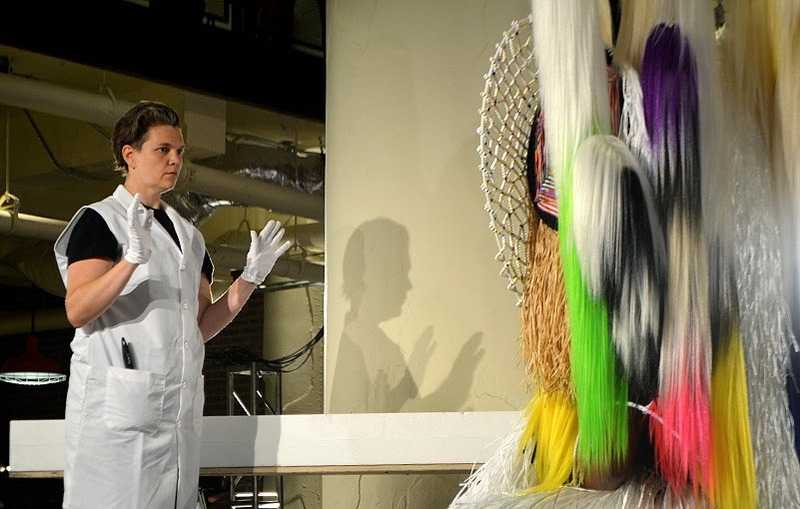 Truthfully, I thought this segment was interpretive until I finally realized that it was a final costume check and an unhurried opportunity for the dancers to ready themselves to balance what must be rather heavy ensembles. Intended or not, and as thought-provoking as the performance is, it carries with it a degree of humor. 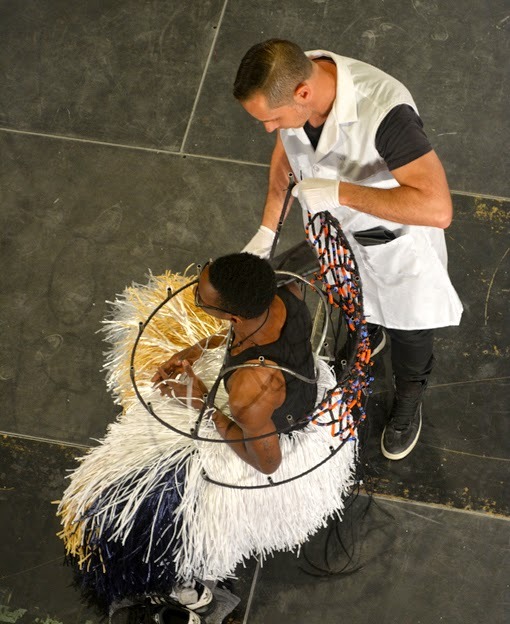 From a two-foot tall scarf-wearing duckie—part of the costume adornments—to the dressers using large brushes to groom the super-sized fury costume elements, there were ample opportunities to enjoy the quieter of the two performances. I heard that some felt that the performance was slow and too long, but I think those people totally missed out. Frankly, just about the time that I started to think the same thing was the precise moment I began relax into the piece and immensely enjoying it. It's not at all slow. It calms the mind to a point of reflection and introspection, as well as speculation about the story unfolding on stage. It was also when I looked quite closely at the costume design and detail. What appear mere common materials—an aluminum Christmas tree, a crocheted throw, and various beaded pieces...to name only a few—are actually a complex and intricate chorus of exterior persona. The opening moments of this particular performance began with the dancers "disrobing"...not completely, of course. We knew then that we were in for something not quite expected. What it became, and what it truly was from the beginning, was quite beautiful. I mentioned that there were two performances. The first took place on the main level and among the guests! Notice the "drum major" on the far right of the above photo. He was magnificent and delightfully energetic, as were the other colorful performers. Both performances were superb. I definitely recommend seeing this show if you can swing tickets. I'd like to thank Carrie of Launch Atlanta for letting me know about the show. 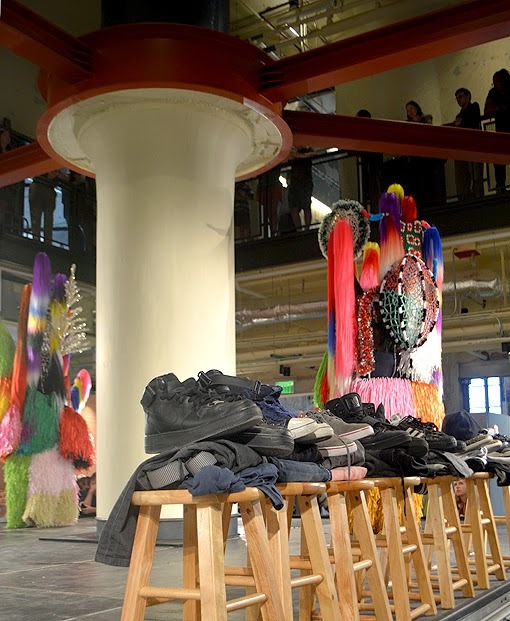 Nick Cave's Up Right: Atlanta is at Ponce City Market for the weekend. 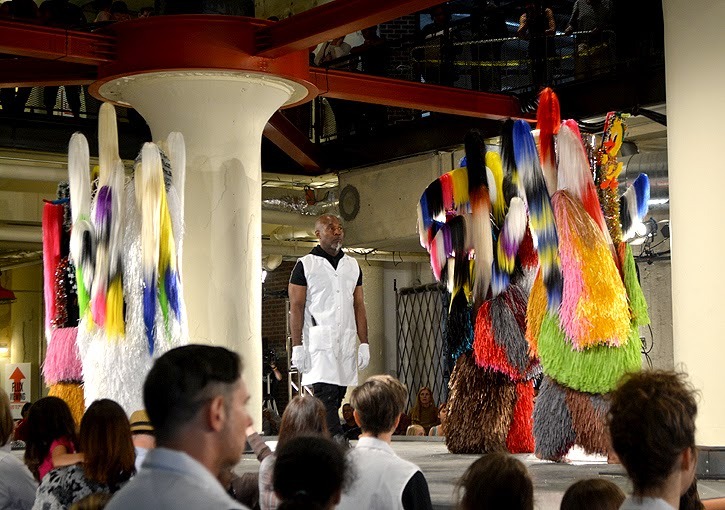 I've heard that performances are selling out (they're free, but require reservations), so check their website for tickets before heading over.If you' don't make it to this show, watch for more of Nick Cave's artistry and definitely look for other Flux Projects events! Want to see something you've never seen? Want to see something you've never seen, and likely never will otherwise? Mysteries of the Unseen World, now showing on IMAX at Fernbank Museum of Natural History, gives you such an opportunity. You and your fellow visitors might even want to take in a double-feature, like I did yesterday! 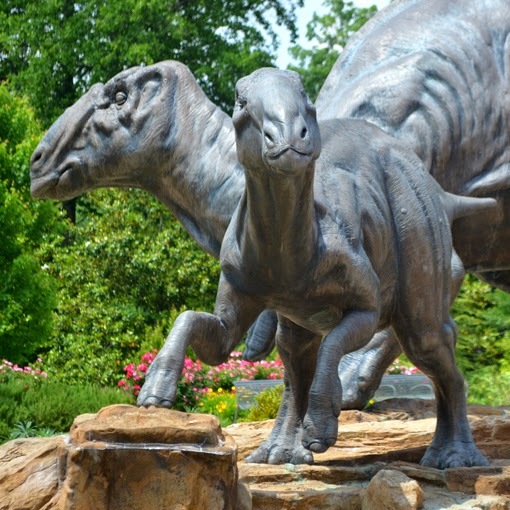 Visitors to Fernbank are greeted at Dinosaur Plaza by a trio of hadrosaurs known as Lophorhothon atopus, which once lived in the region that is now Georgia. I share that with you so that you know that if you don't have time to explore the museum AND take in a movie, you still get a dinosaur experience. But do come back when you have more time to explore...it's a fantastic museum! What you can't see...can fascinate! Mysteries of the Unseen World is a magnificent film that explores things that are too small—really, really small!—as well as things that move too fast or too slow for the naked eye to see. Did you know that what we see—with the naked eye—is a tiny fraction of of what's really going on in our world, and the universe? The film tells us about some of the light spectrum that we don't see, and so much more! Fernbank Museum of Natural History is open, with IMAX films rolling, seven days a week. But, if you can't make it to Fernbank during the week, consider Martinis & IMAX on a Friday evening, 7:00 p.m. to 11:00 p.m. (except for holiday weekends). It's a great evening of live music, dancing, food, cocktails and IMAX films! Enjoy the National Geographic Movie Mysteries of the Unseen World at Fernbank Museum of Natural History through Thursday, July 16, 2015. Go have fun at Fernbank and see what you've never seen before! A new love affair is always exciting. Especially when it's one that has developed over the years. Although I've been a fan of dance all my life—you should have seen me in the 80s and 90s—looking back, even I was surprised to realize that I've attended three Atlanta Ballet performances since December. Each was unique and absolutely thoroughly magnificent. 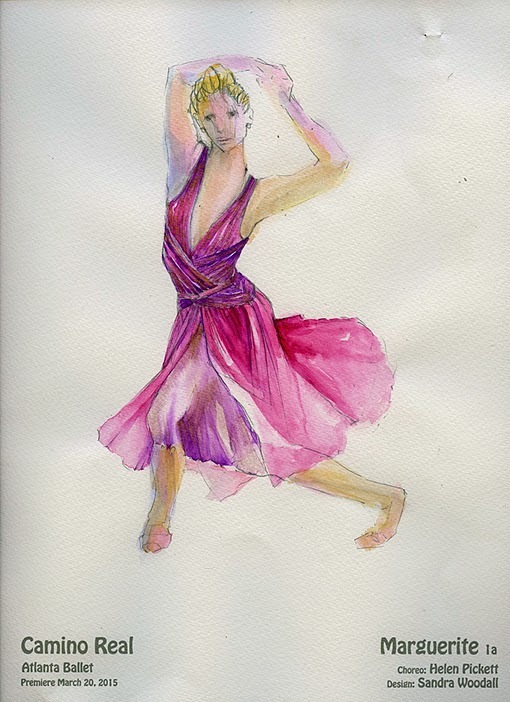 I've always admired dance—in its many forms—but I can now say that I'm a true fan, a love affair of sorts, of ballet. With a particular zeal for Atlanta Ballet. In December, my best friend treated me to Atlanta Ballet's Nutcracker. 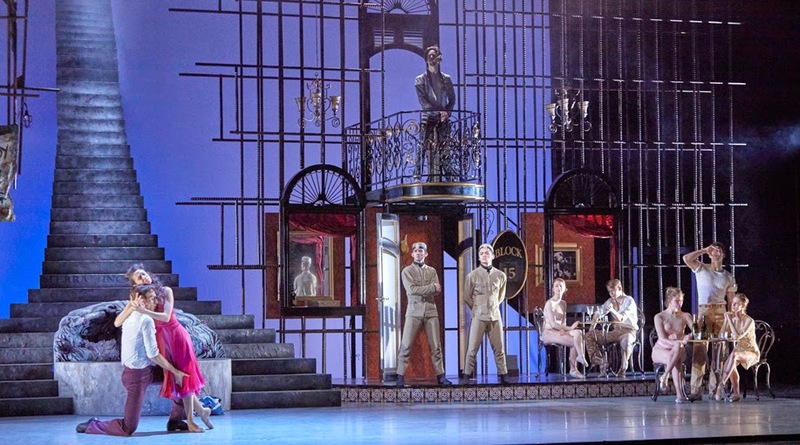 In February I treated myself to Romeo et Juliette—Gold Section seats!—and just last month, Atlanta Ballet treated me to the world premiere of Camino Real. Already I can hardly wait for the next performance! Atlanta Ballet knows how to do Opening Night! And a Red Carpet Opening Night is a fantastic experience. Most recently I attended Opening Night of Camino Real with my dear friend Nancy and our pre-show and intermission experience at Cobb Energy Performing Arts Centre was magnificent. Pre-show and intermission entertainment varies from show to show, but in my brief experience it includes a DJ spinning lively music, dance performances, specialty cocktails, there's a gift shop, usually more than one private reception going on, and when attending Romeo et Juliette in February, I and hundreds of others were witness to a proposal of marriage. She said, "Yes!" Cynthia Bond Perry's ArtsATL review of Camino Real is particularly well-written, especially for an audience that follows dance. I invite you to read it in its entirety. I definitely agree with her use of the word "unusual", for it was that indeed. But in the most wonderful of ways. For the skeptics who envision taking a nap at the ballet...not going to happen at a performance of Camino Real! It's incredibly mesmerizing. Atlanta Ballet's Nutcracker has been a favorite tradition for many since 1995. And for many young Atlantan's (and us older one's too), it was a first experience of Nutcracker, a first experience of The Fox Theatre, and a first experience of Atlanta Ballet, perhaps even the first time seeing a ballet! I can't even imagine Atlanta Ballet's Nutcracker not being part of all the spectacular holiday offerings Atlanta has to offer, especially one this special. I've met people who have seen it many, many times and others who have wanted to see it for years. I'm well on my way to being in the first group and if you're in the latter group, I hope you'll remedy that this December. 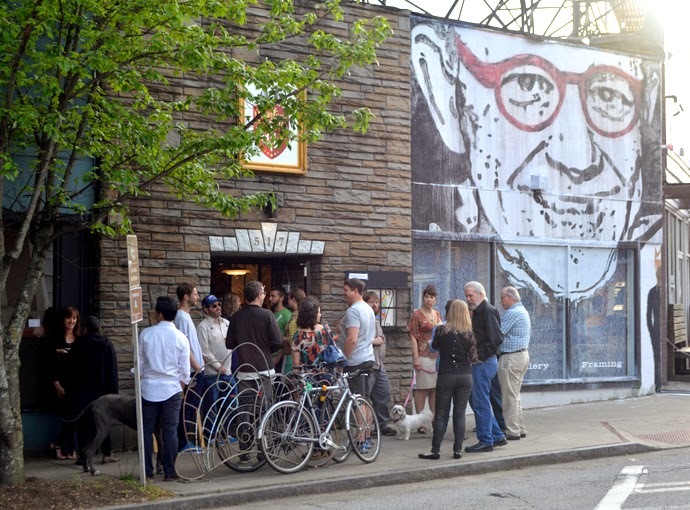 If you're a fan of live music performances—a great majority of Atlantans are—then you're in for quite the treat. The Atlanta Ballet Orchestra performs live every performance. I wish we saw more of them, but we do have the opportunity to express our gratitude with applause—and I encourage you to applaud loudly! Atlanta Ballet has deep roots in live music. In fact, in 1946 the Company became the first in the nation to help fund a symphony by donating that season's proceeds to the Atlanta Youth Symphony, which later became the Atlanta Symphony Orchestra. For this year’s world premiere of Camino Real, the Company commissioned an original score. 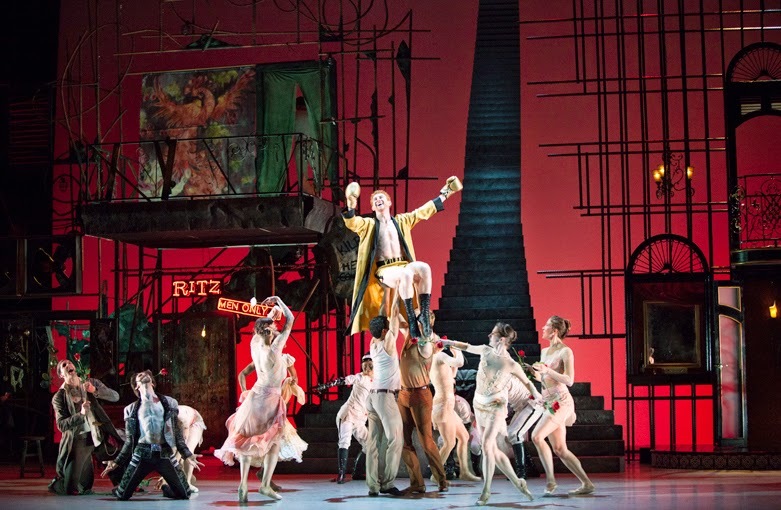 It was new for the composer, the orchestra, the choreographer, the dancers and it was new for the delighted audiences who attended that world premiere weekend. I've never heard anything like it—quite likely because there is nothing like it—and it was remarkable! Congratulations to all who created and brought the score to life. The Michael C. Carlos Dance Centre, Atlanta Ballet headquarters, was designed and constructed to pursue Leadership in Energy and Environmental Design (LEED) certification. Awarded by the U.S. Green Building Council, the Centre achieved LEED-Gold certification when it opened in 2010. Even more impressive, Atlanta Ballet is the only arts organization in the country whose headquarters has LEED-Gold certification, the second highest achievement for LEED certification! I would even suggest that Atlanta Ballet was a pioneer among Atlanta organizations to adopt such a strong sustainability stance so early. At 55,000 square feet, the West Midtown headquarters is twice the size of its former location and only the sixth location in the Company's more than 85 year history. The facility houses five (5) full size dance studios, a physical therapy suite, a student library, a massive costume shop, nearly 8,000 square feet of office space, a full-service box office and a LOT more! Impressive doesn't begin to describe it. Atlanta Ballet danseur Heath Gill is the one company member I've seen perform more than any other. Between Wabi Sabi performances, Nutcracker at The Fox Theatre and performances at Cobb Energy Center, I've lost count of how many times I've seen him. There's comfort in familiarity, of course, but Heath's love for what he does shows in his performance. That I admire. The Atlanta Ballet company dancers range in experience from debut season to 20th season! And they represent a vast array of experience and quite a few countries. The breadth of possibilities for what to expect from this compilation of talent is practically infinite. It's wonderfully exciting is what it is! 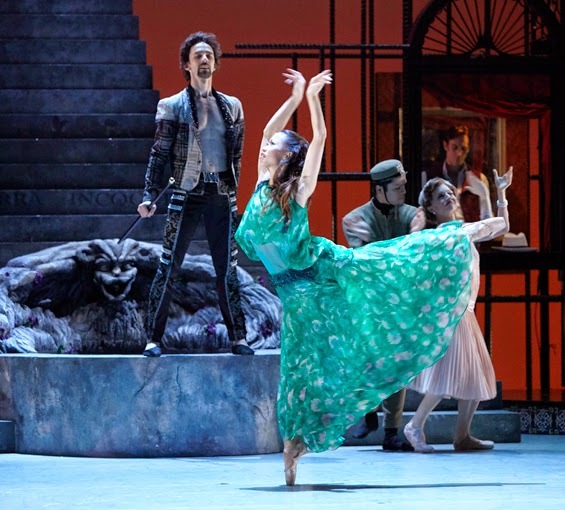 During the press preview for Camino Real, Nadia Mara was a mere few feet away from me—they were running scenes for us in the main dance studio, with mid-construction sets in place—that was pretty cool. Nadia gave a performance of an intoxicated young lady unlike anything I've ever seen on a Hollywood big screen. On film, she'd be an Oscar-winning actress, but I'm quite happy to be able to see her perform live as a heart-winning ballerina. 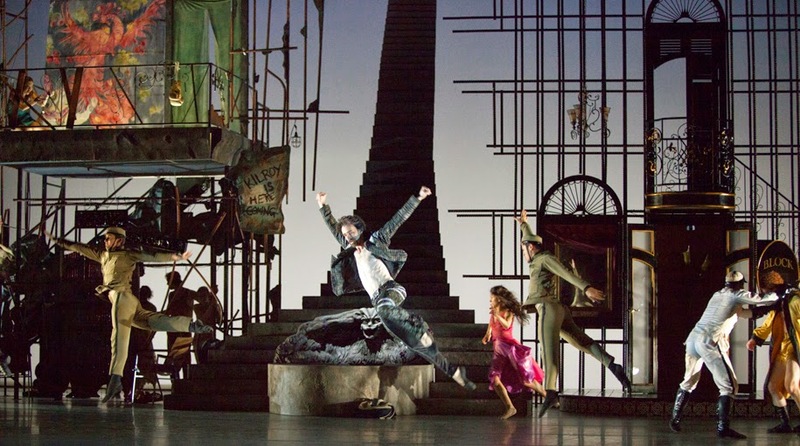 The set for Camino Real was designed and fabricated at Atlanta Ballet's West Midtown headquarters. I had the awesome opportunity to see those sets mid-fabrication during a press preview about two weeks before opening night. Check this out...when they moved to West Midtown, they built their main dance studio to scale of the Cobb Energy Performing Arts Center stage, where the Atlanta Ballet is a resident company. So, you can imagine just how much that facilitates rehearsals, as well as set design. Costumes for Camino Real, being a world premier, were designed, by Sandra Woodall, and fabricated at the Atlanta Ballet campus. You should see their Costume Shop! It's the size of a department store...a mesmerizing and magical place. I've had the pleasure of seeing the Costume Shop twice...once four years ago at a networking event and again recently. It's still a treasure trove of ensembles that will evoke a flood of marvelous memories. 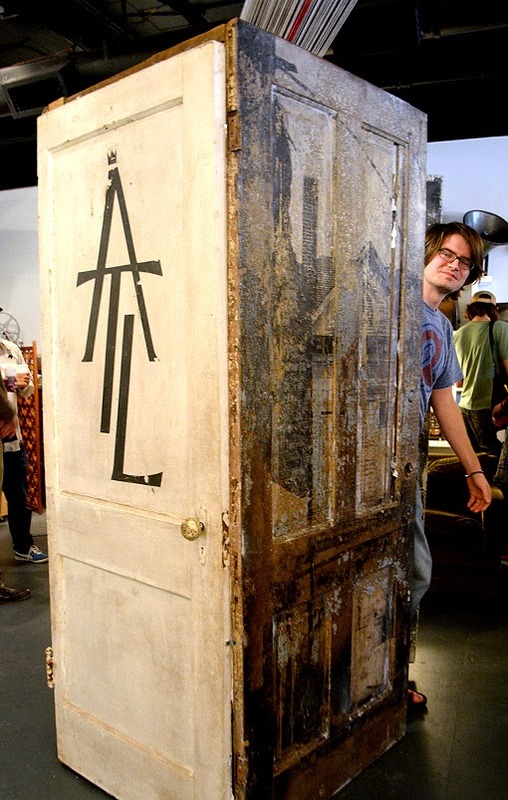 There are many, many shows represented in that majestic closet! We all have aspirations and that one dream career that we're either in or working toward. Believe me when I tell you that it takes more than a village to produce and perform even one Atlanta Ballet show. By supporting Atlanta Ballet, you're supporting the dreams of dancers, choreographers, musicians, engineers, costume designers, facility managers, marketing professionals, set designers...the list goes on and on! And please have a look at what they're doing at their multi-campus Atlanta Ballet Centre for Dance Education! I encourage you to pick at least one—or turn the whole list into a checklist!—and have fun supporting the performing arts and Atlanta Ballet. How will I support Atlanta Ballet, you ask? I will continue to attend performances, I'll continue to share their magnificence on Social Media, and I've always wanted to learn how to tap dance, so don't be surprised if one day I share of video of my inaugural dance recital, the result of classes offered through Atlanta Ballet! To enrich the human spirit through dance; inspire through performance and empower through education, while building on the rich legacy of the art of dance. Well, it's now after midnight and tonight is Opening Night of The Best of Modern Choreographic Voices, three ballets in one performance! It's at the Cobb Energy Performing Arts Center through Sunday, so get your tickets now. I'll see you at the ballet! 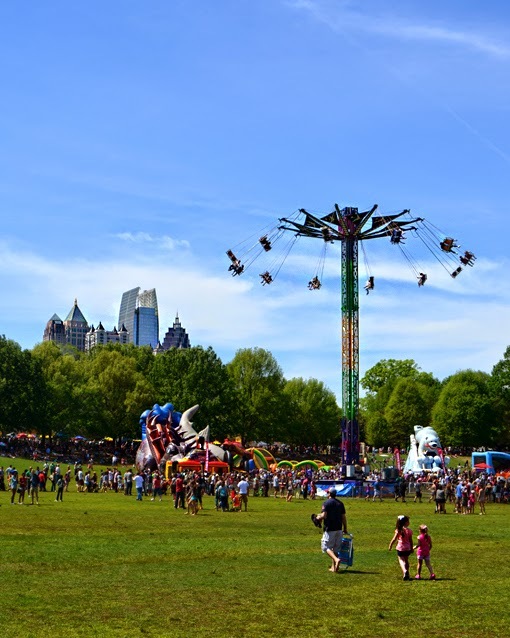 If you didn't make it to the 79th Annual Atlanta Dogwood Festival in Piedmont Park last weekend, you totally missed out on one of the greatest Atlanta festivals yet! Be sure to mark your calendars for next year's festival, even though I can't imagine how they're going to outdo this year's. SPOON! 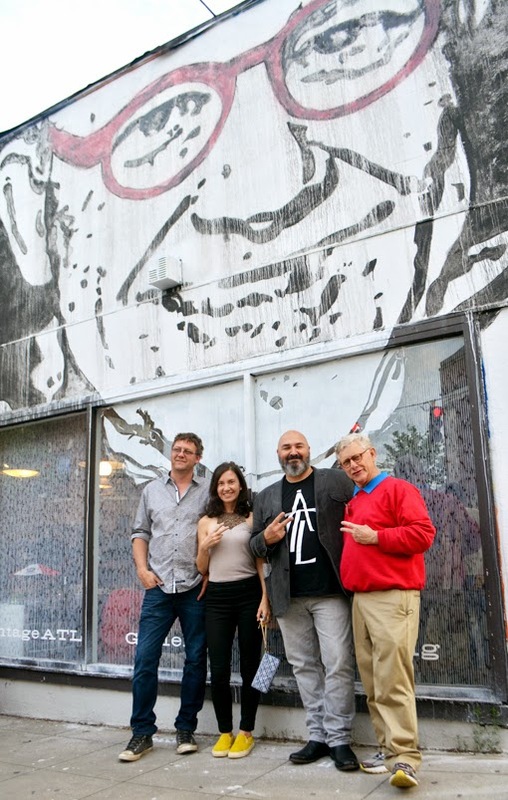 I've had the great fortune of meeting and talking with quite a few artists at Atlanta festivals and that great fortune continued this past weekend. SPOON was the first artist I spoke with at this year's Atlanta Dogwood Festival and her kindness, humor and joviality set the tone for how much I would enjoy the festival. Artwork by SPOON's minimalist approach is her tagline manifested: "Hand Painted Artwork Born From Narrative". 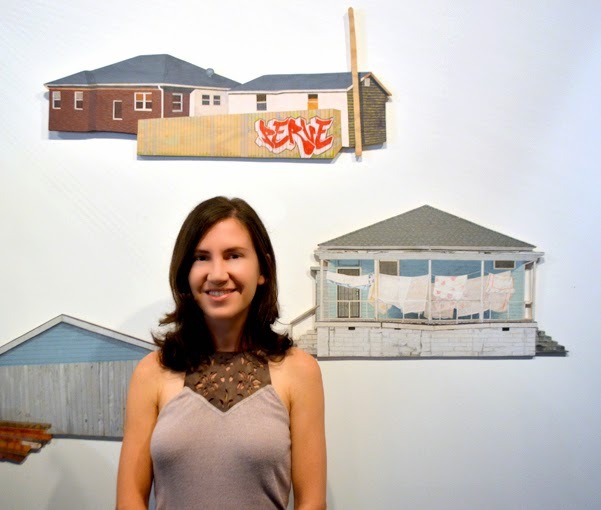 Her work immediately captured my attention and I'm so glad I stopped and explored! I heard others speculating what her work means and what its intent was, but I heard from the artist herself! That she has an awesome sense of humor was a total bonus! The allure of her work gave up the grand reward of recognition. Especially after SPOON showed me how her paintings appear on a mobile phone camera--immediately recognizable. The painting she demonstrated on was one of the unmistakable icon the marquee of The Fox Theatre. SPOON is also a TedxPeachtree veteran. I love her response to the interview question, "What are three words to best describe you?" Her answer, "To be continued..."
"Thank you, SPOON!" for making the festival another fantastic experience. The award-winning International Stage, at The Dock on Lake Clara Meer, was hardly noticed its first year at the festival, but now is a major attraction of the three-day event. In the years I've been back in Atlanta, I recall only large crowds at the International Stage, and for good reason...the performances are fantastic! On the first day of the festival, I had the honor to meet Miss Georgia World 2015, Talisha White, at a festival reception. With an enthusiastic desire for world travel, Talisha will be competing for the Miss World America title this summer. Good luck, Talisha! 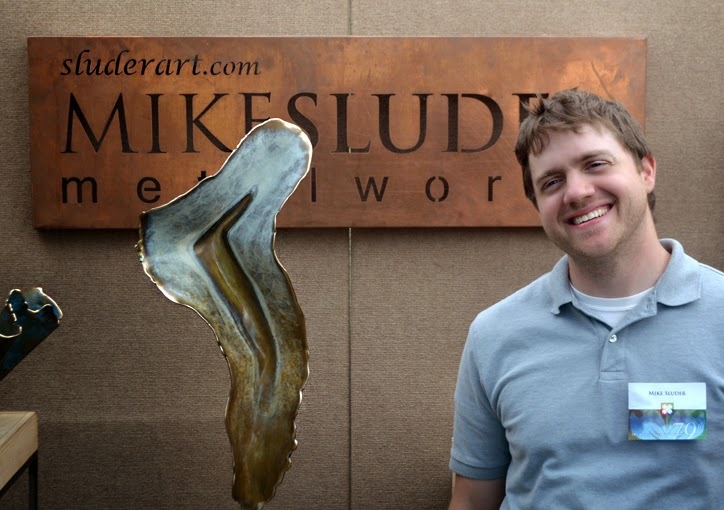 When I asked metalwork artist Mike Sluder about his technique, he shared that he doesn't force the bronze and copper that he works with, but instead he unhurriedly wields the metal in a manner that allows it to reveal a spectacular expression of itself. Okay, he probably wouldn't use those words, but that's how I've come to understand his amazing art. 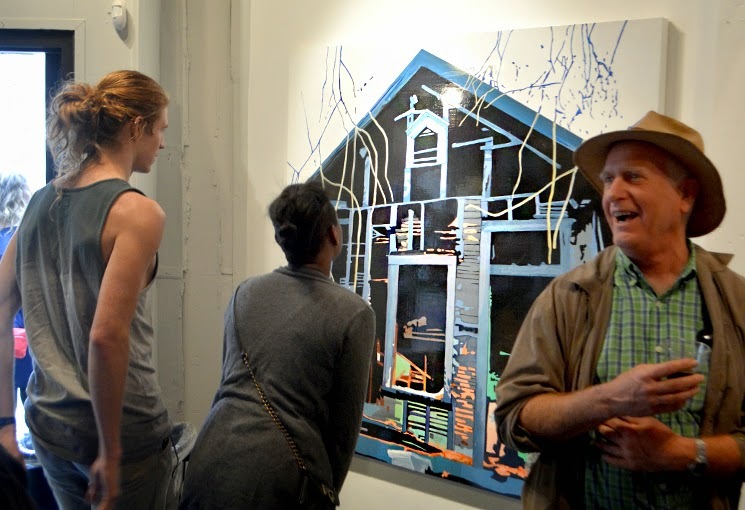 I've had the pleasure of seeing quite a few works by Mike over the years, at shows, in a museum and at art festivals. I hope you get to, too. I appreciate that Mike has always been kind and hospitable and envy the collectors and corporate clients he creates for. 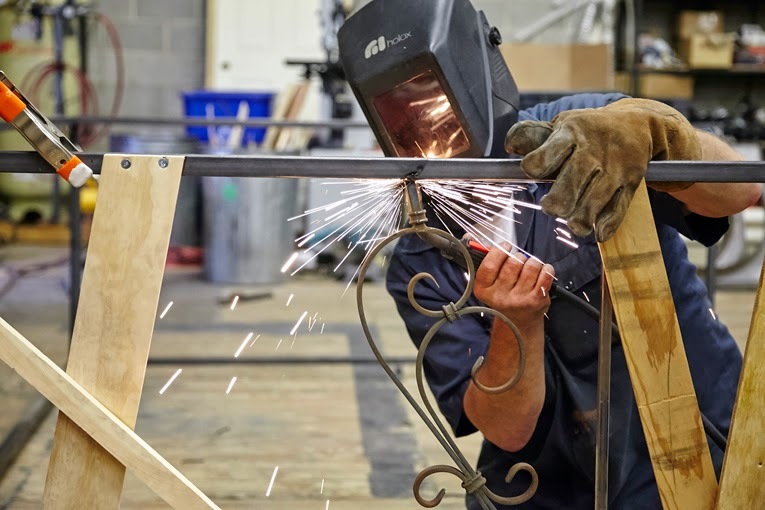 Perhaps one day I'll have one to proudly display, or perhaps you'll invite me to the unveiling party when you bring home the work of art you commissioned from Mike Sluder Metalworks. The Great Chair Hack was back! 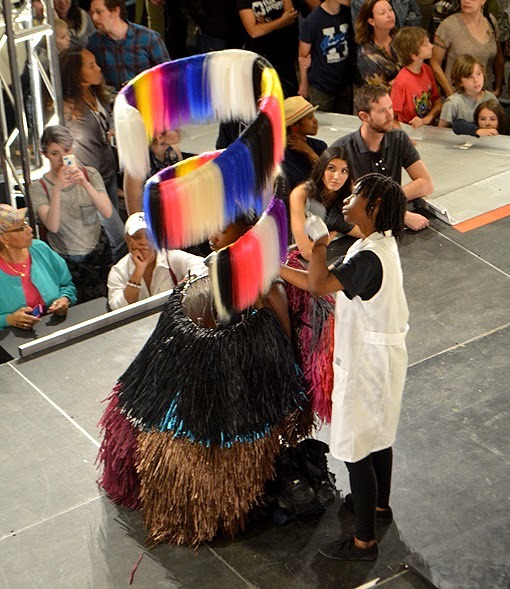 Organized by Museum of Design Atlanta (MODA) and the Atlanta Chapter of International Designers Society of America (IDSA), the competition strongly encourages creativity and imagination...and lots of fun! The teams of 2-4 members are given an unassembled IKEA chair and are challenged to create an "innovative solution". 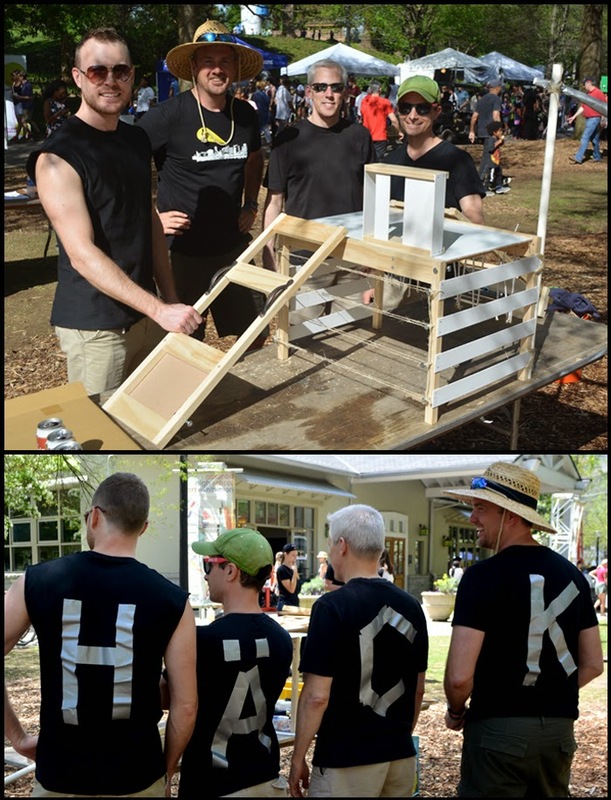 While the gentlemen pictured above didn't place in the top three at the competition--although I love the tiny, highly detailed playground they created--they were the only ones wearing team shirts, so they get the award for team spirit in my book. All the teams looked like they were having a blast and their finished products were impressive! I'm not sure what the prize package was, but the trophy for the top winners were 3D-printed golden statuettes, courtesy of MODA. I sincerely hope this event returns next again year...awesome fun! 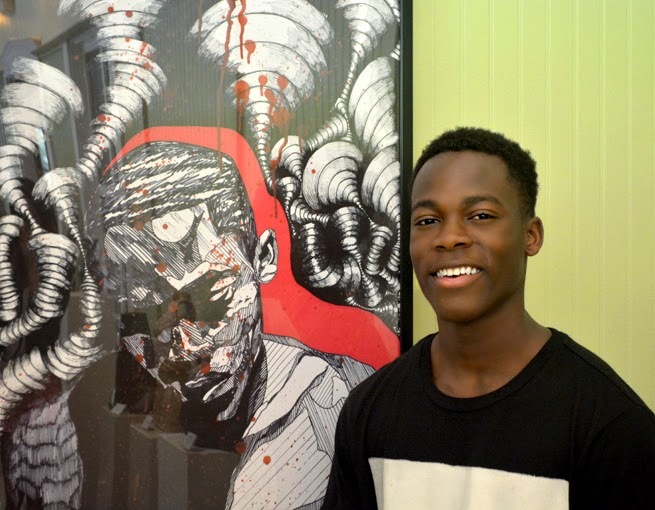 I had the pleasure of meeting one of the artists featured in this year's Atlanta High School Art Exhibition (AHSAE), Dorian Edwards, pictured here with his magnificent mixed media work titled "Self Portrait". I chatted briefly with his very proud mother, too. I must say that the talent represented in this exhibition gives me great hope for the future of artistic expression. A great majority of the work, including Dorian's, is gallery quality. I would not be the least bit surprised to see any of these student artists make it big! Indeed, the young artists whose work was on display were relatively few from the total number of applications received. 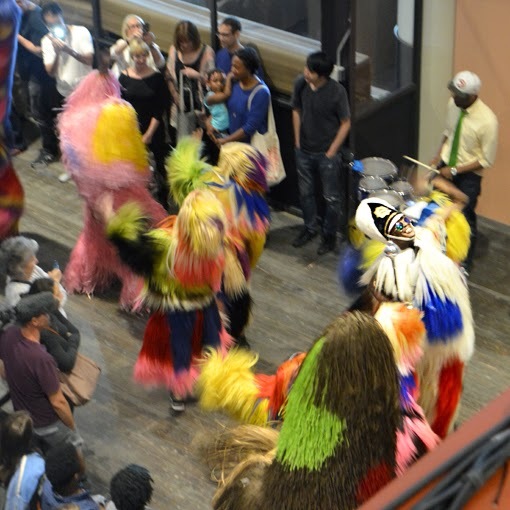 Also at the festival, and happy to share what they're doing for Atlanta and her visitors, were Atlanta Ballet (new show starts this Friday), Atlanta Opera, Center for Puppetry Arts (They had nine puppets onsite! 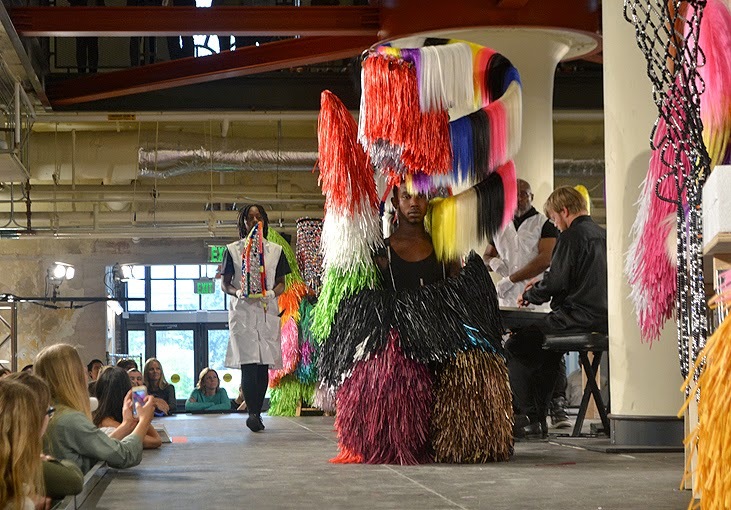 ), The Children's Museum of Atlanta, and Flux Projects...just to name a few! Isn't Wendy gorgeous? She's one of the many, many wildlife creatures rescued and rehabilitated by AWARE, the Atlanta Wild Animal Rescue Effort. Poor thing had a broken wing. And her human companion was awesome! 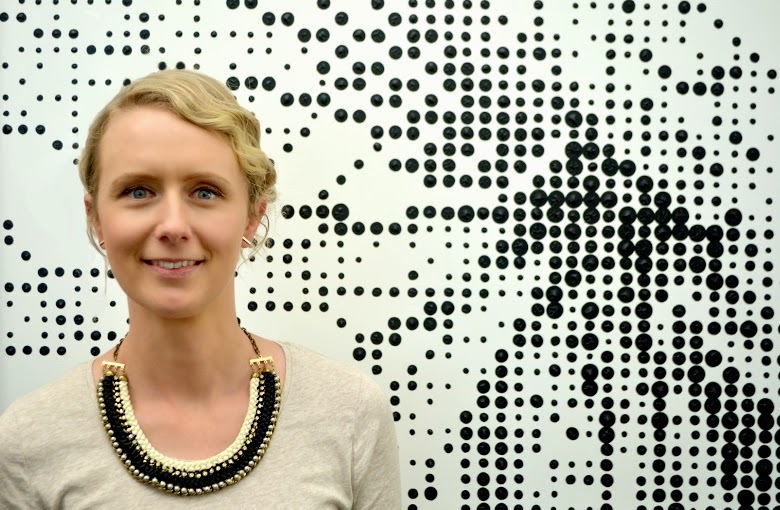 Thanks for sharing so much about AWARE and for sharing Wendy's story. I didn't know this, but it requires a blood test to learn the gender of owls, this species at least. Fortunately for us, AWARE offers tours every Saturday and Sunday at 1:00 p.m. when visitors can meet the resident Ambassador Animals, and learn more about wildlife! If you went to the Atlanta Dogwood Festival and you saw the award-winning Eco-Village, I'm sure you'll agree that it's a wonderful addition to an already fantastic festival! I'm a strong proponent for sustainability and living/going green, so exploring the Eco-Village was great fun, as well as fascinating. AWARE was a new discovery for me, but I was quite happy to see Chattahoochee Riverkeeper and Lifecycle Building Center, as well as the soon-to-open Center for Hard to Recycle Materials (CHaRM) represented. I invite you to explore their websites to learn more about their remarkable contributions to Atlanta. 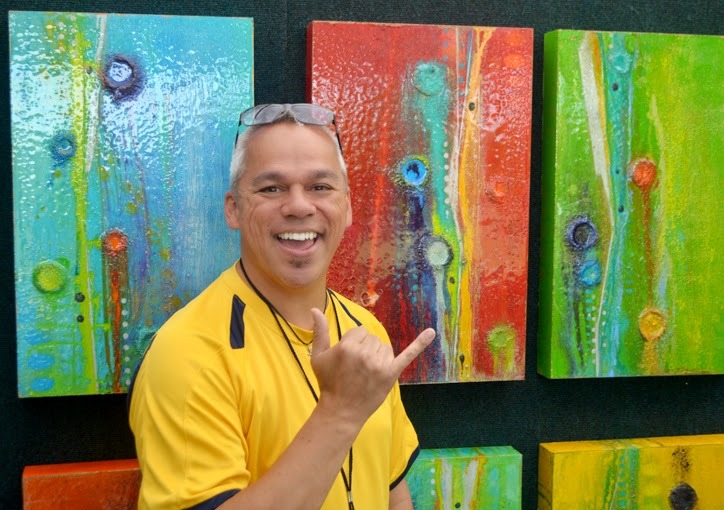 This was MJ Vilanueva's first time showing at the Atlanta Dogwood Festival and his enthusiasm was off the charts, as is his mixed-media original contemporary art! My immediate favorite pieces was a series of thin, vertical works--reminiscent of a circuit board (at least for tech geeks like me)--that sold Saturday morning. All of them! It was great to see many new and first-time artists to the Atlanta Dogwood Festival--and their enthusiasm, and amazing art--and I hope we see more of MJ! Be sure to ask him about "Lucky #13" when you connect with him. 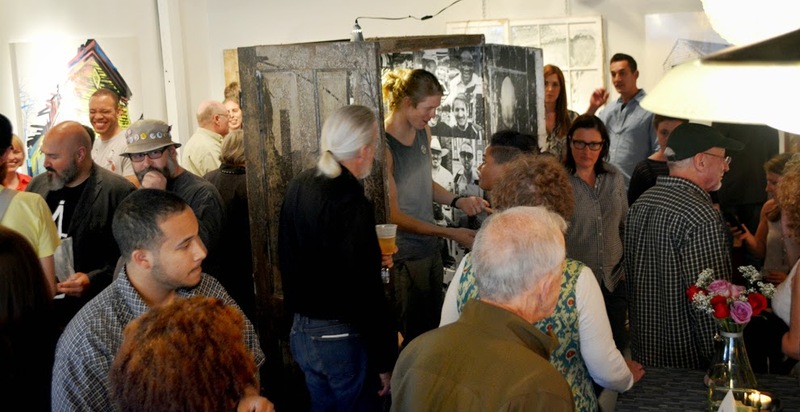 I say again, don't be shy about talking with the artists...they're typically brilliant and happy to talk art! When I asked MJ if I could make a photo of him with his art, he was almost apologetic in his explanation that he has to offer a Hawaiian "shaka" in all his photos. When I told him how many photos I have of myself offering a Vulcan salute we both enjoyed a hearty, understanding laugh. Speaking of enthusiastic, the Atlanta Dogwood Festival added a 5K this year. Director Brian Hill shared with me that they weren't sure what kind of response they'd get, but they had more than 500 runners! In the first year! This race is also a Peachtree Road Race qualifier, further evidence that if the Atlanta Dogwood Festival is going to do something, they're going to do it right! The award-winning International Village has grown significantly since its founding at the Atlanta Dogwood Festival. Dogwood Festival Co-Chair Lesley Frappier shared with me the history of the international features of the Festival--the International Village growing from one country represented to this year capping out at 10 countries represented. 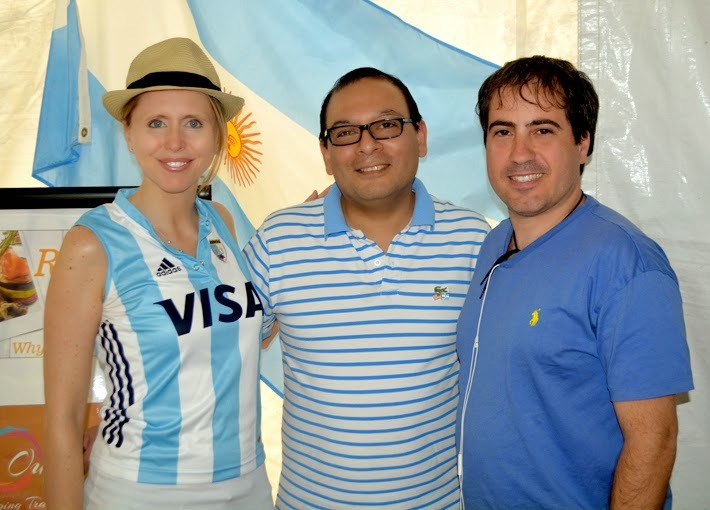 The photo above are representatives, and a friend, of the Consulate General of Argentina. When I found out that Argentina was part of the International Village I had to meet them and share that my 2004 two-week trip to Buenos Aires and Iguazu Falls was one of my all-time favorite vacations! What great fun reminiscing with them. They were also giving away a Chimichurri recipe that I can hardly wait to try! Greg, of Watercolors by Greg Stones, has a new book out: Sock Monkeys Have Issues, and it's just as hilarious as his others! Of course I had to stop by and buy my own copy and Greg kindly personalize it for me saying, "You are so much cooler than any sock monkey, ever!" I haven't gotten a compliment like that in...well, ever! Sock monkeys are pretty darn cool, you know. If you've followed me for any length of years, you know that I've made a tradition of making a photo of or with Greg. Zombies and sock monkeys are quite as cooperative as Greg, who is much more agreeable. Anyway, this year I invited a few members of Greg's fandom. All but one fan smiled for the photo...but perhaps she was just concerned about the ninja lurking around the booth. 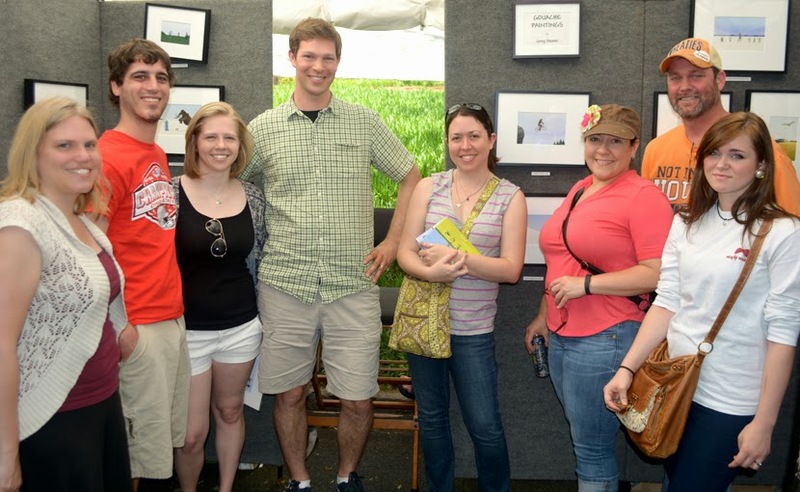 One of the things that I love about the Atlanta Dogwood Festival is that they mix artists and art mediums. I might not have visited a watercolor section years ago (they've never sectioned mediums that I recall) and would have missed out on some of the best laughs ever. 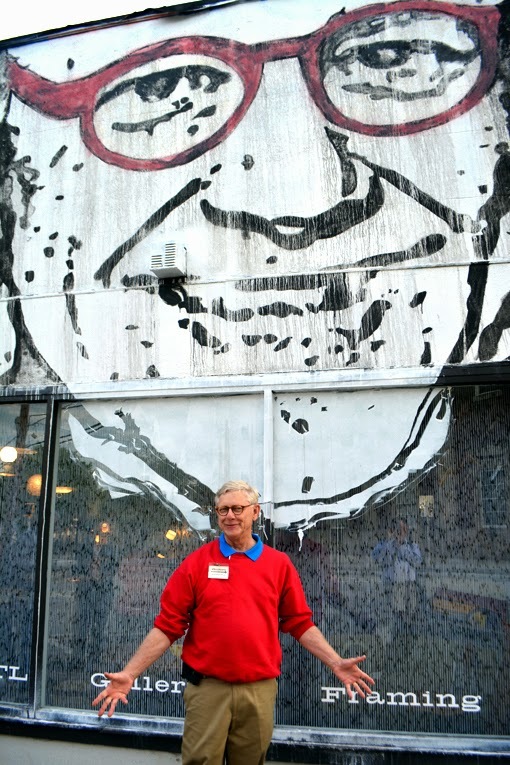 Greg is a favorite artist and I can't imagine the Atlanta Dogwood Festival with him and his humor there. The one thing that they do show collectively are Georgia artists, so if you're looking for something by a local artist, it's easy to find. 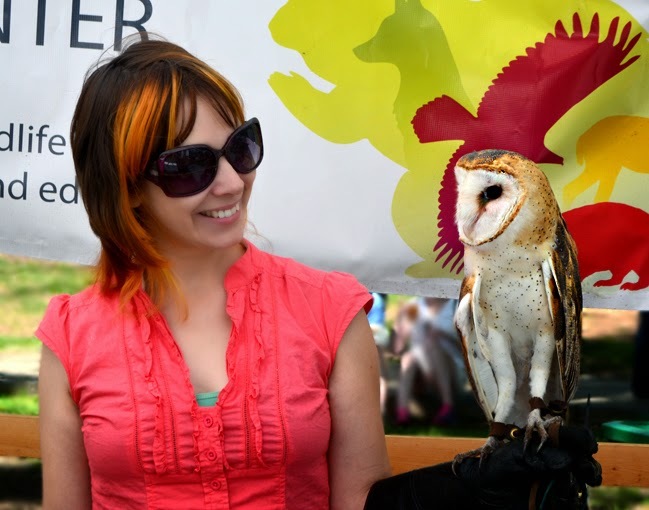 Otherwise, explore the Artists Market at your leisure...there are hundreds to discover! May I also mention that one of the local artists that I always enjoy seeing and catching up with is Elaine, from Elaine Rader Jewelery. Gorgeous work! The Kids Village at the Atlanta Dogwood Festival offered more this year than ever before! There were so many rides and experiences, it made me want to be a kid again. It's always great to see the kiddos having a good time at one of Atlanta's premier festivals! Vince Pompei - Shows the brilliance and creativity a person can have with merely spoons! Art by Tai - This artist reinforces that there's a LOT in the details. Tai's work is magnificent, particularly in the details. And he's incredibly clever. David Burton Art - Complex and completely fun! I love the monochromatic black sculptures! Bruce Holwerda - I didn't get to meet Bruce, but find his work fascinating and unlike anything I've seen. I particularly like his "Wheels & Orbs" series. Eric Grimes Art From Scraps - This was Eric's first time at the Atlanta Dogwood Festival and he took the ribbon for "Best of Wood". Congrats, Eric! 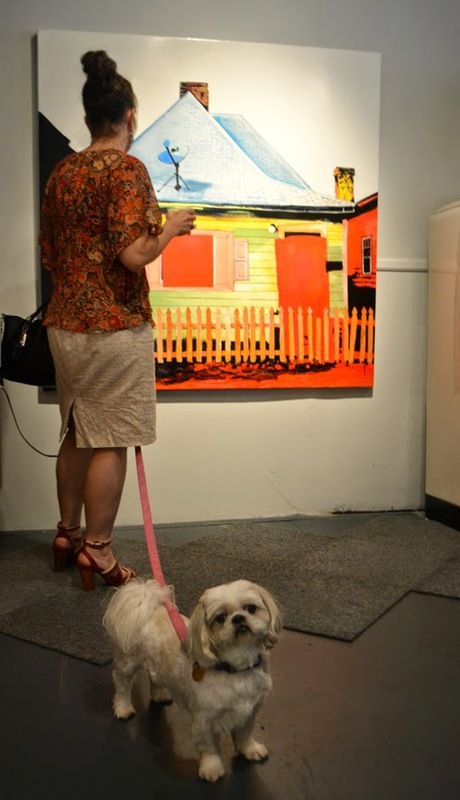 I visited the Atlanta Dogwood Festival on Friday, then went to an opening reception (Thank you, Launch Atlanta for the invite to the reception.) and then went back on Saturday and explored for an additional 5.5 hours! And I could have happily returned for the third day! It was that much fun. I invite you, and encourage you, to visit the Atlanta Dogwood Festival website, and "Like" their Facebook page, for announcements of what promises to be a magnificent 80th Annual Atlanta Dogwood Festival! Don't miss it!